Celebrate the freedom to read and the 30th anniversary of Banned Books Week! Behold the power of the forbidden word and support Banned Books Week with this captivating Forbidden poster. Banned Books Week highlights the benefits of free and open access while drawing attention to the harms of censorship by spotlighting actual or attempting bannings of books across the United States. 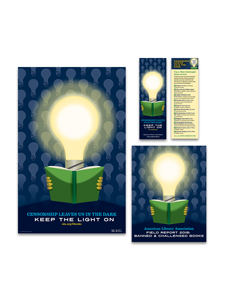 Librarians, teachers, booksellers, and community leaders can use this significant week to emphasize the importance of the First Amendment and the power of uncensored literature.The Forbidden poster features The Adventures of Huckleberry Finn, by Mark Twain; Nickel and Dimed, by Barbara Ehrenreich; To Kill a Mockingbird, by Harper Lee, and The Absolutely True Diary of a Part-Time Indian, by Sherman Alexie; the dictionary; Beloved, by Toni Morrison.